Mango nutrition that will rev up your energy levels through the roof! Mango Nutrition that will Rejuvenate Your Health! While we all may not be living in the tropics we can still reap the benefits found in mango nutrition. There are many delicious tropical fruits that bring lush, rich taste to our everyday diets. King of these tropical wonders is the ordinary mango. Did you even guess that there are mangoes eaten in the world than any other fruit? There is little wonder that this tasty delicacy is often referred to as the King of Fruits in many countries. For people who enjoy smoothies, a mango can be one of the healthiest and most delicious ingredients available. If you want to rev up your diet and boost your health all you have to do is make mangoes a part of your life. Let’s take a minute to learn some facts about the many nutrition benefits of mangos. There are more than 30 species of mangos available in different parts of the world and each is incredibly fragrant and tasty. This fruit is economical to buy and extremely filling, but it is packed with vitamins, minerals, antioxidants and fiber. Mango nutrition facts make this humble fruit a top choice to add to your diet. Mangos are potent and powerful foods that are good for you, and they are low calories too. Now how sweet is that? When you eat mangos, you are enjoying a lush, delicious taste sensation. Plus, you are also providing your body with an abundant supply of healthy nutrients. The phenols that are in mangos act as antioxidants to fight the damage done by free radicals. There are also high levels of Vitamins A, C and E which are antioxidants. They also boost your immune system. This means that when you enjoy this fruit you are also helping your body repair and rejuvenate itself at the cellular level. Energize your immune system with such a simple fruit. You can have clearer, younger looking skin and a healthier body just by sipping on mango smoothies. People who are concerned about wrinkles, acne, eczema, aging or illnesses can counter these problems with the antioxidant power of mango nutrition. There are some phenol compounds in mangoes that appear to be useful in preventing some types of cancers. These nutrition benefits of mangos may keep you safe from many cancers and tumors. This makes it even more appealing to add a mango a day to your diet plan. People who are concerned about fats and carbs can enjoy mango smoothies with a clear conscience. An average mango has about 120 calories, is low in carbs at 17 grams and contains 1 gram or less of fat. This means that it is a perfect food for anyone watching their weight. This fruit is also excellent for those on a low carb or a low fat diet. Mangos make a delicious and nutritious treat that can soothe and settle an upset stomach or an irritable digestive system. This food is easily tolerated even by individuals who may have trouble digesting many other kinds of fruit. People who have problems with heartburn, GERD or ulcers can use a mango smoothie to help restore inner balance to their bodies. The nutrition benefits of mangos also include an amazing amount of fiber content. This is a natural way to add bulk to your digestive system. One mango contains almost half the daily fiber requirement for an average adult. This dietary bulk will help prevent common problems like constipation or diarrhea by normalizing and regulating the bowels. People who work or play in the outdoors a lot may lose potassium as they sweat. Adding a mango to the diet can replace this potassium quickly. It is well known that the nutritional benefits of mango fruits include a ready supply of potassium. 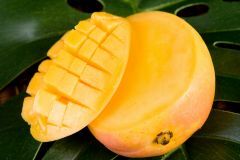 If you are pregnant or nursing and are concerned about your body’s level of iron, the mango again comes to your rescue. Eating mangoes in some form every day will build up your stores of iron. Having enough iron in your bloodstream is necessary to prevent anemia and low oxygenation. If you are concerned about heart disease, high cholesterol or high blood pressure, you need foods that are heart healthy. This is another area that benefits from the superb power of mango nutrition. The Vitamin E, Beta-Carotenes and Selenium in this fruit will give you extra protection against heart and circulatory problems. Plus, it lacks heart damaging properties, such as cholesterol. Want to have fresh mangos from the tree? But perhaps you live in a colder climate. Don't despair! Try growing a Paw Paw tree! They produce similar fruit to bananas and mangos. 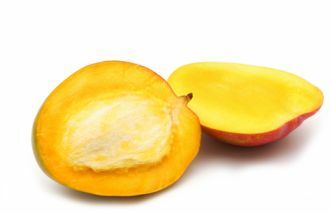 Paw Paw even have similar nutrients to mango nutrition. Plus, they can grow in colder climates. Get more info on Paw Paws Here! Mangos are one of the tropical fruits that will ripen to perfection even if you should buy one while it is still in the green stage. A ripe mango will still be firm, but will give slightly to the pressure from your finger. The coloring of most commercial mangoes is a rich red when they are ripe, but they may have some yellow, orange or green color still present. There are also some mangoes that turn yellow as they ripen. Do not choose fruit that has sunken areas, black spots or cuts in the skin. You can always tell when a mango is reaching its full ripeness potential because the fragrance will become more distinctive. The aroma has been described as a combination of pineapple, melon and berries. The inner flesh of the fruit will be a deep golden yellow or light orange in color and it closely resembles the flesh of a cantaloupe. This is when the nutrition benefits of mango fruits are at their highest levels. Cutting a mango can be a bit of a challenge. Save money and time by buying frozen mangos for your fruit smoothie recipes. You can develop your own way of peeling and using a mango because there really is no wrong or right way to enjoy this wonderful fruit. You can use a paring knife to remove the outer skin and then cut sections from the fruit. The large slender, center seed is inedible and will be discarded. I usually cut on either side of the seed. Then just separate the meat from the skin with a knife and enjoy the pure goodness of mango nutrition.